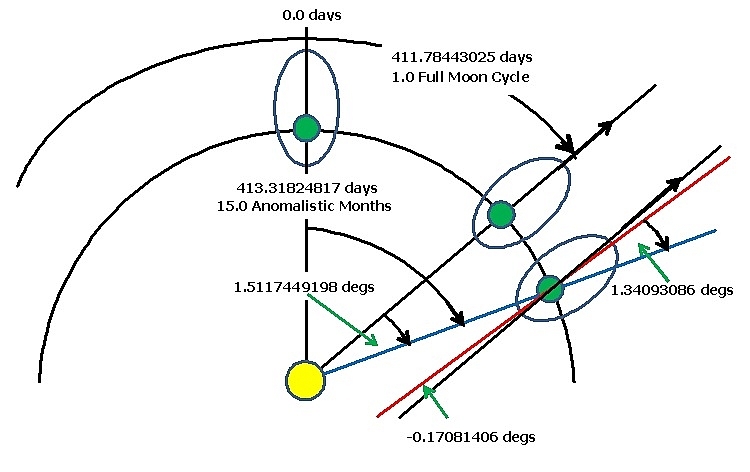 The diagram below shows the Perigee of the lunar orbit pointing at the Sun at 0.0 days. In addition, the diagram shows the Perigee of the lunar orbit once again pointing at the Sun after one Full Moon Cycle (FMC) = 411.78443025 days. It takes more than 1.0 sidereal year (= 365.256363004 days) for the Perigee to realign with the Sun because of the slow pro-grade (clockwise) precession of the lunar line-of-apse once every 8.85023717 sidereal years. 1.0 FMC falls short of 15 anomalistic months (= 413.31824817 days) by 1.53381792 days (= 1.5117449198O). During these 1.5117449198 days the Perigee end of the lunar line-of-apse rotates by 0.17081406O in a prograde direction, producing an overall movement of the line-of-apse (red line) of 1.34093086O (= 1.5117449198O – 0.17081406O) with respect to the Earth-Sun line (blue line). S = the angular revolution (in degrees) of the Earth about the Sun over DT days. L = the orbital precession (in degrees) of the lunar line-of-apse over DT days. D = S -- L = angle between the lunar line-of-apse and the Earth-Sun line after DT days. we find that if we take the incremental angle between the lunar line-of-apse and the Earth-Sun line over DT days (= 1.3409308624 degrees) and divide it by the 360 degrees of movement of the angle between the lunar line-of-apse and the Earth-Sun line that has occurred over the previous FMC, it effectively has the same value as the incremental number of days between 15 anomalistic months and 1.0 FMC (=1.5338172 days) divided by 1.0 FMC i.e. While this is not remarkable, what is remarkable, however, is that both of these fractions (whether they be measured in degrees or days) are precisely equal to the cumulative annual precession of the Perihelion of the Earth's orbit (measured in days) over a period of 1.0 FMC! = 0.0037248062 days per 1.127384686 sidereal years. N.B. The current value for the precession of the Perihelion of the Earth's orbit is 11.615 arc seconds per year. However it is increasing and will achieve a value of 11.723 arc seconds in roughly 2490 A.D.
1. The cumulative precession of the Earth's orbit over a period of 1.0 FMC has the dimensions of days per year! 2. The increase in angle between the lunar line-of-apse and the Earth-Sun line as you move from 1.0 FMC to 15 anomalistic months (= 1.34093086 degrees) seems to be almost precisely equal to the FULL annual precession of the Perihelion of the Earth's orbit (= 11.723 arc seconds per year) PER DAY accumulate over 1.0 FMC i.e. The question is, what angular motion associated with the movements in Sun-Earth-Moon system can cause the ANNUAL precession of the Perihelion of the Earth's orbit to accumulate DAILY? I am not aware of any mechanism that would produce a motion like this and I would appreciate if anyone could solve this interesting lunar puzzle for me! Is it something to to do with the interaction between the mean and true anomalies of the Earth's orbit and the Moon's orbit? Could motion of the Earth and moon about the common centre-of-gravity have and effect? What about the effects of 18.6 year nutation of the Earth's rotation axis?